Experience more maneuverability, the ability to get into tight spaces, and shorter mowing times with our zero-turn radius mower. 23HP/691cc EPA/CARB approved engine (as rated by engine manufacturer, shipped without engine oil). 4 gallon engine fuel capacity. 3600 RPM (maximum non-load) engine speed. 7mph forward max., 3.75mph reverse max. transmission speed. Electric keyed ignition start. 12V/33AH battery. Three 20.5″ width blades. PTO, throttle, choke, ignition switches, left and right motion control levers. 1.5″ to 4.5″ (7 positions) cutting height. 60″ cutting width. 18×9.5-8 turf (rear), 11×4.00-5 smooth (front). 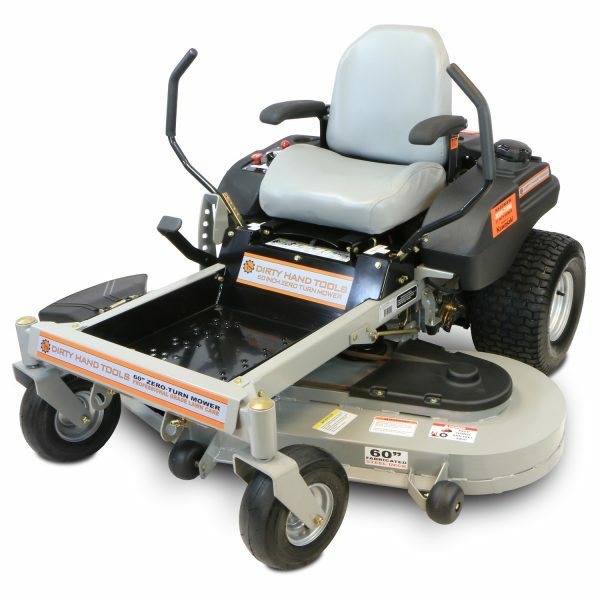 61″ (w/o discharge cover) cutting deck width. Fabricated steel deck. Seven cutting heights. Dependable Hydro Gear Transmission. Safety switch integrated into the seat.